Fall is here y'all! It is finally finally here, and welcome to Blogtober! After the longest and hottest summer of my life I couldn't be more thrilled to bust out my boots and chunky knits. Personally, I have been waiting, what feels like a lifetime, for fall to arrive and now that it is here I am soaking up all the fallness I possibly can. I recently relocated to an area that has more shopping than just a Wal-Mart and Ross and one thing Milo and I have been doing in our free time is exploring the local shops. From the Park City Outlets to the local Target. Here are just a few of my neutral home decor favorites I have seen roaming the isles. Am I the last one to hop on the neutrals bandwagon, or what!? I have been obsessed with neutral home decor while adding in pops of color since I purchased my teal, yep I said teal, sofa from Wilson Bates. When you have a large color piece of home decor, much like my sofa, it can look too busy when decorating with even more color so a nice neutral can really class up the look of a room in a subtle way. 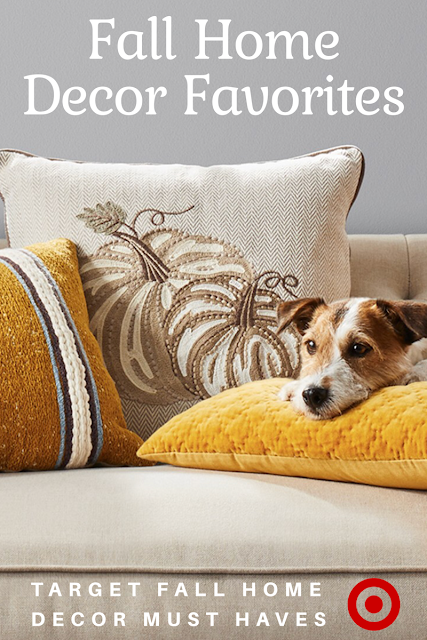 Much like this fall pumpkin pillow. Pops of color, like we just talked about. What a more cozy way to embrace those pops other than a lusciously faux mohair throw blanket. Fall is the time for snuggles, a nice hot beverage, and shamelessly binge watching epic tv series. For fall binge worthy series inspiration check out my Netflix watch list. As a Notre Dame fan I am loving the gold and navy, but this throw also comes in berry and silver. Over the past few years, my tastes have matured. As I research homes to settle down with my son I have been fascinated with narrowing down my likes and dislikes. Defining my personal style. One thing that has not changed is my love for tuft furniture. An elegant classic design that can compliment many styles and suite most tastes. This sofa is the perfect size for an entry, upstairs landing, or like in my imagination for this piece a home office. I don't have unlimited funds or unlimited space to store all sorts of various seasonal and holiday decor, so multifunctional pieces like these vases are perfect for transitioning from season to season. With a simple change of flowers these can go from a Thanksgiving evening to a damp spring morning. Starting at only $4.99 you can't beat it. Every room I have ever decorated I have gotten to the end... Almost finished, but something was always missing. For some reason chairs are always the last on my mind when it comes to home decor. Anyone else over see this obvious choice, or am I just the only crazy one? This chair is classic and chic while the rich brown leather is perfect for fall. Pair next to a bookcase or a gold bar cart for a completed simple though elegant look. There are not many things in the world I love more than a chunky knit sweater. Now you can get that chunky knit sweater feeling two fold.. (pun intended) I have been seeing these blankets everywhere and I mean everywhere. Blogs, vlogs, pinterest, friends, family, neighbors. The people who have actually let me in on their secret of where they found this gem the price has always been very very high. Into the hundreds of dollars for a single throw, pure nonsense, but this one from target comes in many colors and is currently on sale for only $26.99. These are just a few of my fall loves I found in the Target Home Decor section since moving to Salt Lake City. It has been hard to be so far away from those glorious red circles. Y'all better be ready to see more posts, videos, and photos including my Target favorites in the future. I'm sure my debit card is tired, but I am thrilled to be cashing in on all the deals, coupons, and charming pieces Target offers. If you haven't already seen Milo's rock n roll vintage inspired fall toddler clothing haul feel free to check it out.